Roses, daisy's, pansy's and more! 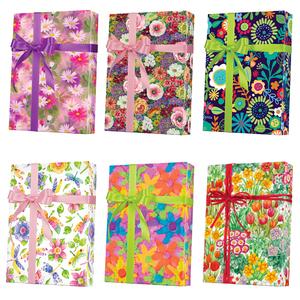 Floral gift wrap is beautiful. It comes in smooth patterns and holographic patterns. Some of these patterns are very realistic. Many sizes available, full ream, ½ ream, cutter box and jeweler's rolls. You will find giftwrap from Jillson Roberts, Shamrock and Sullivan.